My little pony cake birthday Cakes Long Island New York. This is a My Little Pony Cake made for a little girls 2nd birthday party. Its a 2 tiered chocolate cake with sweet vanilla buttercream filling. Both tiers are wrapped in pink fondant and decorated with all the necessary my little pony cake trimmings. Straight Down the middle of this my little pony birthday cake is the eye catching fondant waterfall which glides just below a beautifully colored rainbow. The carefully placed sun, clouds, grass and pretty flower accents help add to this cakes beauty and originality. We even added a few of your favorite ponies to the cake such as Pinkie Pie and Fluttershy. We humbly admit that this is probably our favorite my little pony cake, compared to all the others that we have ever seen. Remember that we can always customize any cake you see on this website. So if you'd like your my little pony cake to have different colors or different cake fillings just let us know and we will make it happen. 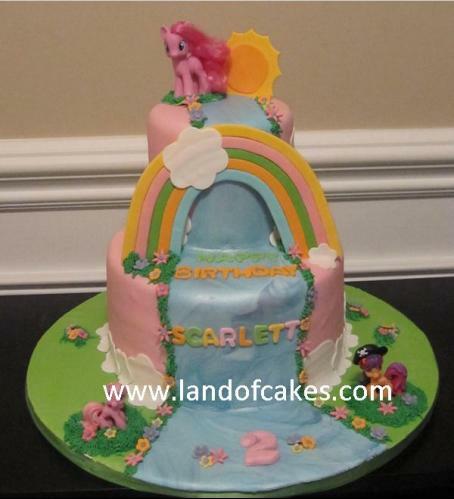 All of us here at Land of Cakes New York would love to make your next my little pony cake.